The management of Smart Fabrication is committed to ensuring that all employees, contractors, visitors, and the public are safe from injury and risk to health whilst they are on Smart Fabrication’s premises or on site. 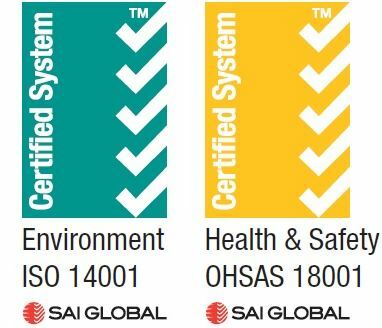 As part of our commitment to ensure employees, contractors and visitors are safe from risk of injury and our impact on the environment is minimised, Smart Fabrication has put a HSE Management System in place and achieved certification to OHSAS 18001 and ISO 14001. The company has appointed a HSEQ Manager to ensure that this system is maintained and clearly understood by all. OHSAS 18001 is an international standard designed to standardize our approach of managing health and safety in the workplace. It will improve our commitment to prevent ill health and maintain legal compliance. Our behaviour and commitment to continuous improvement every day demonstrates that safety is our highest priority, equal only to quality. Maintenance of safe operating procedures at all times is our greatest priority not only to us as an employer, but to our employees, their families, and their communities. We also have strategies in place to account for the safety of the public, contractors, and employees of partner organizations we work with. A safe workplace and a safe and healthy working environment. Safe systems of work. Machinery, equipment, and substances in a safe condition and securely stored. Information, instruction, training (such as MSDS and SOP), and supervision necessary to ensure that each employee is safe from injury and risks to health. Regular WHS committee meetings and discussions with employees on all issues which may affect their health and safety. Effective injury and illness reporting, recording and investigation, and effective rehabilitation measures for employees who suffer work-related injuries and illness.